Kanka is a mouth pain liquid and member of the Blistex brand family.Â It is ideal for treating canker sores and other abrasions inside the mouth because it delivers maximum strength medication and forms a long-lasting film that protects sores from further irritation. 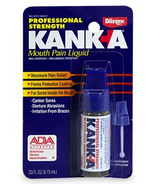 Kanka is a mouth pain liquid and member of the Blistex brand family. It is ideal for treating canker sores and other abrasions inside the mouth because it delivers maximum strength medication and forms a long-lasting film that protects sores from further irritation.